Slots Heaven is one of the more recent casino brands from Mansion who are also owners of Casino.com and just like every gaming establishment under their auspices, it is licensed by the Gibraltar league. The parent group has been in the online casino business since 2003 hence Slots Heaven is sure to enjoy from the vast experience garnered over the years. The contract that Mansion also entered into with English Premier League (EPL) giant Tottenham Hotspurs about a decade ago increased its acceptance across the UK; the deal was the first of its kind in the EPL. In recent years, the company has been in some sort of partnership with Manchester City with a view to exploring more frontiers within the gambling industry. All these efforts are clear indicators that Slots Heaven are in for the long haul and could very soon be one of the industry leaders. Slots Heaven Casino client runs on PlayTech powered software which comes with a robust suite of slots and other casino games. The Playtech reputation in the gaming world combined with the extensive experience of the gaming establishment is the main backbone of the advanced and delightful gaming experience. Apart from the array of games available at the casino, breathtaking graphics and sounds also help attract many players into the fold. The website is designed in such a way that pages are quickly loaded with as little lag as possible. As a matter of fact, the speed of the downloadable casino software is almost double that of the impressive flash play. The website which has a flash play embedded ensures that players can enjoy their favorite games directly from any browser both on their PC or Mac. However, the anti-popup security software must be disabled even though the games will pop out in another window. There is also a downloadable program which can be installed on personal desktop computers. Players can then log on gaining full access to a very wide range of games instead of having to use the web browser. From our own experience, the downloadable desktop version is the most suitable way to enjoy full gaming experience but the downside is that it is only available to Windows users. 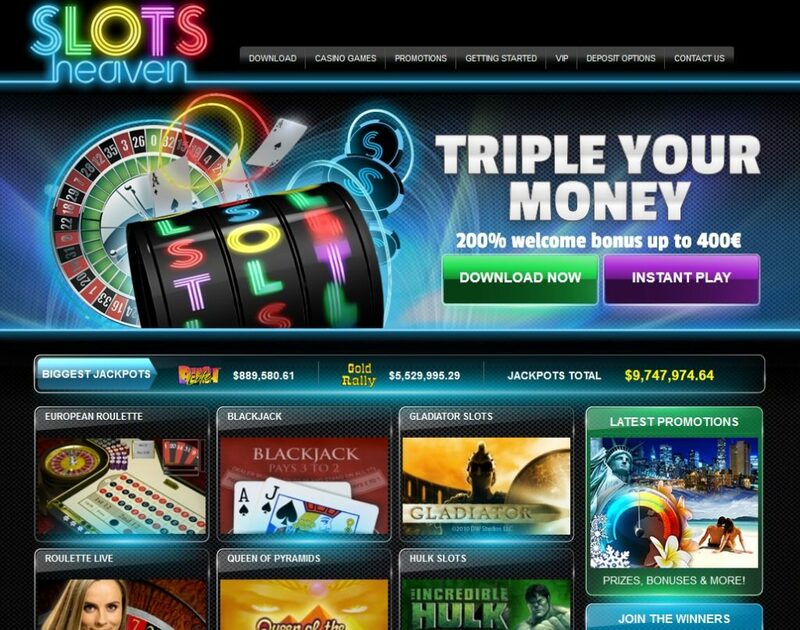 Another major setback for the Slots Heaven is the limitation for mobile devices. There is no dedicated site to support users with mobile devices at the moment meaning that mobile device owners have access to just a many game as do the players using the desktop version. Suffice to say that if the phone is not compatible with the latest version of Adobe Flash Player, such device will not be able to access the gaming site. The Slots Heaven main website is quite similar to the Las Vegas days with a classic neon theme that quickly flashes nostalgic experiences however a lovely black colored fibre pattern is added to give a modern feel. 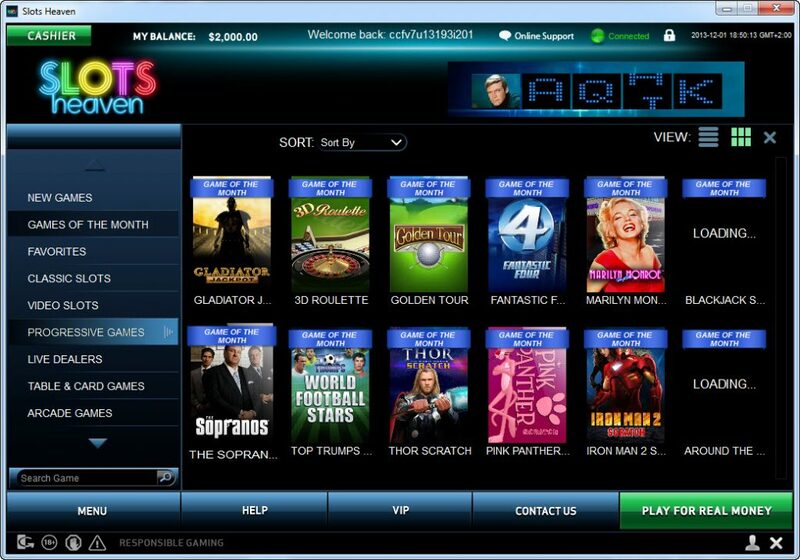 The games offered by the casino are aligned on the second tab with nine more tabs beneath the second one providing details on some of the most popular games available. There is also a submenu that shows all the options such that players can quickly sift through hundreds or games. Players are also able to keep track of the very lucrative choices of games using the jackpot counter while a layout helps them locate these games easily. The Slots Heaven website is so designed to ensure ease of access and quick navigation. Contrary to what many may think about availability of games majorly based on the name Slots, the gaming site actually offer several non-Slot games which include live casino options. There is a standard practice mode for all games offered and this allows players to attempt any of the almost 100 slots games for free before staking any real money. Some of the Slot titles available at Slots Heaven are Little Britain, Gladiator, Iron Man 3 and Fantastic Four. The slots games are also categorized into video multi spin, progressive play and classic single line. Non slot lovers also have other casino games like the Premium French Roulette, Blackjack Peek, and Caribbean Stud Poker amongst others. However, the Live Casino can only be enjoyed on the downloadable casino client and not the flash powered version. Slots Heaven does not have any bonus codes available for new players instead, the welcome bonuses which are more often than not very generous are available to players as soon as they register and make initial deposits. After this stage, specific restrictions and regulations are expected to be religiously followed if a player must earn bonuses offered all through the year. At this moment, Slots Heaven Casino is giving a welcome bonus of 200% up to the 400 eur limit at your first deposit. 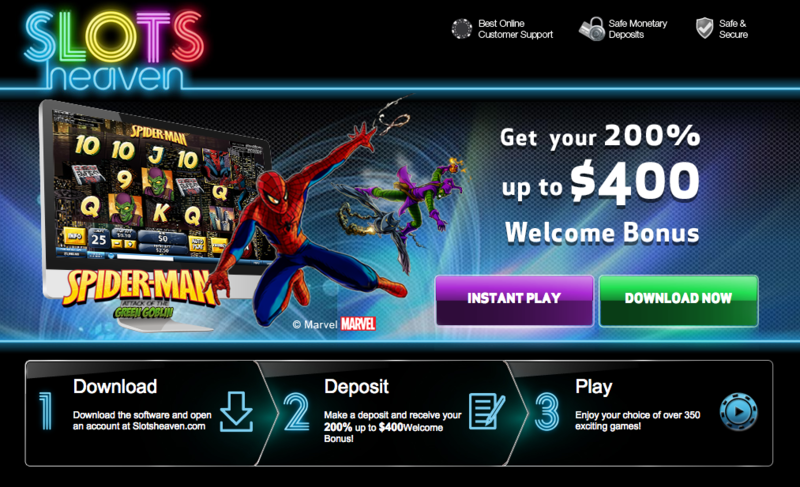 Slots Heaven offers several methods of payment with which deposits can be made to the casino. The payment process is secured using the sophisticated 128-bit encryption that is used mostly in financial transactions. All major debit and credit cards are also accepted not excluding virtual prepaid cards like the Entropay and paysafecard. Players can also do a direct bank transfer, or eWallet systems like Neteller and Skrill. On the overall, Slots Heaven combines experience and modern technology to provide players with classy and fun filled online gaming experience with a wide array of games to choose from across downloadable and flash powered versions. One thing they must fix as a matter of urgency is the lack of mobile gaming software which may deny them of several players who plan to play the games using such devices. Other than this singular issue, Slots Heaven Casino is the place to be for any casino lover. At this moment, Slots Heaven Casino is giving a welcome bonus of 200% up to the 400 eur limit at your first deposit.